The European Federation for Medicinal Chemistry (EFMC) and ChemBridge Corporation have been organising since 2004 the successful series of the International Symposium on Advances in Synthetic and Medicinal Chemistry. The first edition was held in Moscow, followed by St. Petersburg in 2007 and 2011, Kiev in 2009 and again Moscow in 2013. 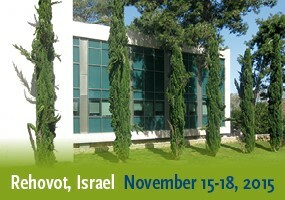 The 6th EFMC International Symposium on Advances in Synthetic and Medicinal Chemistry (EFMC-ASMC’15) is scheduled for November 15-18, 2015 and will be held at the Weizmann Institute in Rehovot, Israel, in combination with the 13th Annual Meeting of the Medicinal Chemistry Section of the Israel Chemical Society. This symposium will bring together chemists from industry, academia and start-up companies from around the world and is centered on the most recent advances in new synthetic methodologies, total synthesis, organometallic chemistry, medicinal chemistry, drug discovery and development leading to new or improved methods for the synthesis of pharmaceuticals. Beyond key lectures in synthetic and catalytic chemistry, as well as recent case studies in medicinal chemistry and drug discovery, the symposium aims at extending the range from ‘small molecules’ to ‘large molecules’ including carbohydrates, natural products, novel protein scaffolds and genes; it is expected to attract experts in synthetic chemistry, medicinal chemistry, total synthesis, catalysis, drug discovery, molecular imaging, and chemical development. We strongly encourage young scientists, particularly graduate students and postdoctoral fellows, to attend this symposium!